Subaru Telescope has added another dimension of information about one of the most studied of all compact galaxy groupsStephan's Quintet. Located within the borders of the constellation Pegasus, Stephan's Quintet consists of a visual grouping of five galaxies, four of which form an actual compact group of galaxies; one additional galaxy appears in images of the group but is much closer than the others. Refinements in observations of the quintet are revealing more about its members. A comparison of images (the left and right images in Figure 1) compiled by using a suite of specialized filters with Subaru's Prime Focus Camera (Suprime-Cam) have shown different types of star-formation activity between the closer galaxy NGC7320 and the more distant galaxies in Stephan's Quintet. They show the quintet in 3-D. Figure 2: A diagram of the member galaxies of Stephan's Quintet. NGC7320 is a closer galaxy and has a recession velocity of 0. The remaining four are a group of more distant galaxies 300 million light years away. The researchers believe that the merging of NGC7318A/B and NGC7319's crashing into them are responsible for the active star formation regions in the Hα emitting region around NGC7318A/B. Processing of the filtered images resulted in the two different views of Stephan's Quintet shown in Figure 1. The image on the left shows the galaxies when the observers used the Hα filter with a recession velocity of 0 while the one on the right shows them when they used the Hα filter with a recession velocity of 4,200 miles per second. The left image shows Hα emissions that indicate an active star-forming region in the spiral arms of NGC7320 in the lower left quadrant but not in the other galaxies. The right image contrasts with the left and shows a region of Hα emissions in the upper three galaxies but none from NGC7320. Two (NGC7318A and NGC7318B) of the four galaxies are shedding gas because of a collision while a third (NGC7319) is crashing in, creating shock waves that trigger vigorous star formation. Figure 2 depicts the relationship of the galaxies. Gas stripped from these three galaxies during galactic collisions is ionized by two mechanisms: shock waves and strong ultraviolet light emanating from the newborn stars. This ionized gas emits bright light, which the Hα filter reveals. 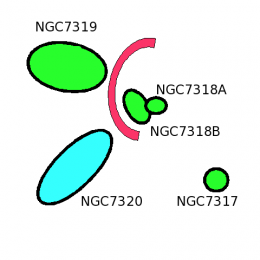 Thus the researchers believe that NGC7319 as well as NGC7318A/B are driving the star-forming regions in the Hα emitting region around NGC7318A/B. In addition to star-forming activity, the images indicate the distances of the galaxies. Different recession velocities help observers spot cases where objects located at different distances appear in proximity in the same image. The contrasting images show that NGC7320 is closer than the other galaxies, which show active star formation at a significantly higher recession velocity (4,200 miles per second) than NGC7320 (0). NGC7320 is about 50 million light years away while the other four galaxies are about 300 million light years away. This explains the intriguing arrangement of the galaxies in Stephan's Quintet. Why do the ionized gas clouds stream out from galaxies? The researchers believe that the merging of NGC7318A/B and NGC7319's crashing into them are responsible for the active star formation regions in the H emitting region around NGC7318A/B. I would appreciate an explanation of the a.) observations and b.) reasoning that causes a specific region to be labeled "star forming."